For courses in Computer Programming with Python. Introduction to Computing and Programming in Python is a uniquely researched and up-to-date volume that is widely recognized for its successful introduction to the subject of Media Computation. 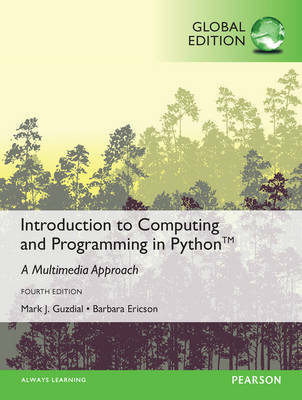 Emphasizing creativity, classroom interaction, and in-class programming examples, Introduction to Computing and Programming in Python takes a bold and unique approach to computation that engages students and applies the subject matter to the relevancy of digital media. The Fourth Edition teaches students to program in an effort to communicate via social computing outlets, providing a unique approach that serves the interests of a broad range of students. MyProgrammingLab® not included. Students, if MyProgrammingLab is a recommended/mandatory component of the course, please ask your instructor for the correct ISBN and course ID. MyProgrammingLab should only be purchased when required by an instructor. Instructors, contact your Pearson representative for more information. MyProgrammingLab is an online homework, tutorial, and assessment product designed to personalize learning and improve results. With a wide range of interactive, engaging, and assignable activities, students are encouraged to actively learn and retain tough course concepts.